Alphabet Soup Blog » Blog Archive » No Second Chances? They say there are no second chances, but recently I found that statement to be not entirely true. I’ve designed and executed art for many covers of TIME magazine. 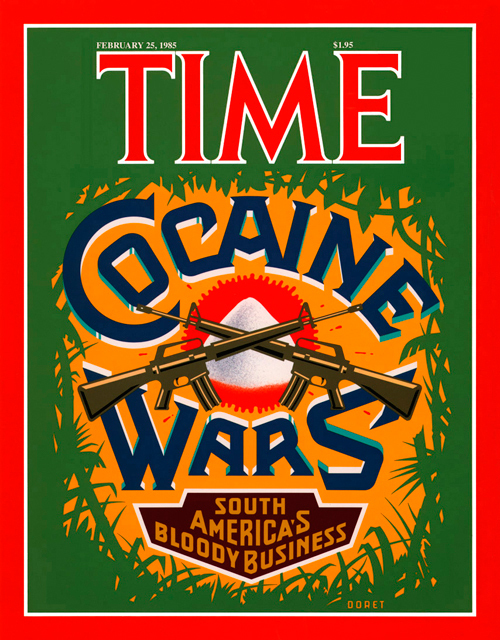 I was never entirely pleased with the cover I did for TIME’s “Cocaine Wars” story. 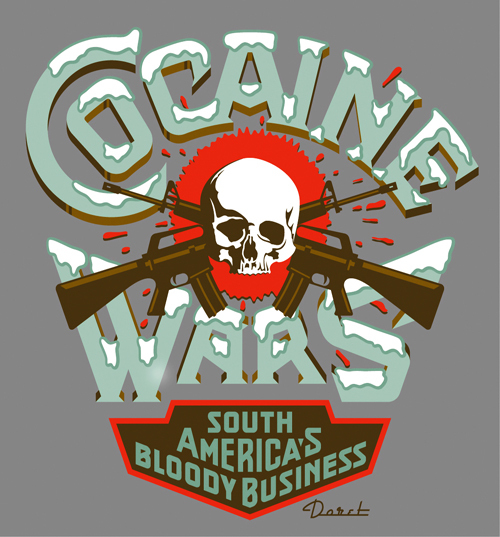 I had originally wanted to focus the design around a skull image, and to have the letters in “Cocaine Wars” have snowcaps on them like the letters you’d see on ice machines. But the powers-that-be at time had me eliminate the skull (too menacing) and in it’s place illustrate a small mound of “cocaine”. The result as you can see was a still a fairly good cover but with a focal point that was kind of anti-climactic. Fast forward to present day: Rick Klotz of FreshJive—an LA streetwear manufacturer, who also runs his flagship store Reserve in the heart of the Fairfax district—contacted me to see if they could license some of my older designs for silkscreened T-Shirts. He immediately gravitated to some of my TIME covers—including “Cocaine Wars” among others among others. Since I would have to reconfigure the art for silkscreen anyway I immediately saw this as an opportunity to make good on that design that I never felt right about. Freshjive will be distributing that T-Shirt design among others of mine in two different color schemes for their Summer ’09 line. If Spiderman 2 and The Godfather 2 can do a sequel equal to the original so can you.